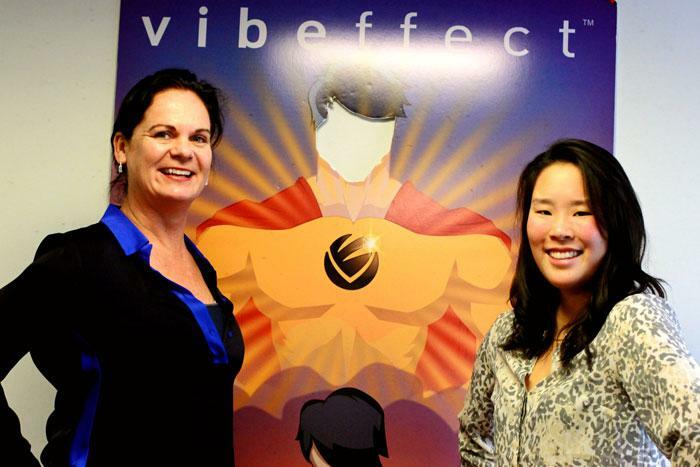 Elena Cox '86 (left) and Sunnie Ko '11 now work together at Cox's start-up, vibeffect, a company that helps students find the right college. Since graduating Dickinson in 1986 as an English major, Elena Cox has trail-blazed a diverse career in nonprofit leadership. Now the former English major is CEO and creator of vibeffect, a start-up based in Washington, D.C., that uses a newly patented method for predicting the best college environment for prospective students. Read more about what keeps her motivated, her inspirational mentors at Dickinson and the unforgettable Dickinson program that inspired her to work with students. I am an entrepreneur: the co-founder and CEO of a start-up based in Washington, D.C. Our team has created and patented a new method for predicting in what college environment a person is most likely to thrive on three dimensions—personal, academic and social. Our work fits into a category called complexity science. Coming out of Dickinson as an English major is a perfect fit for translating and swimming in this space dominated by mathematicians, scientists, researchers, academics and implementers. The mental grit required to stay focused, remove distractions and sustain momentum. Every once in a while we all have to deal with an investor or contractor with extremely challenging interpersonal or communication skills. Can you speak to how Dickinson’s "useful education" might apply to your career? While at Dickinson, I benefited from a team of mentors that I could never have imagined would appear in my life. These included amazing faculty, administrators and people from the city of Carlisle. They offered me such a diverse set of challenges and opportunities to work, collaborate, lead and receive constant feedback. Because of this team, I came away from Dickinson with tremendous confidence and curiosity about my intellectual and practical ability to contribute to a team, whether as leader or follower. What was your favorite organization at Dickinson? There are many, but if forced to pick one, it would be PEER, a community program that's been at Dickinson for several decades. This program built up the self-esteem of local 6- to 12-year-olds, took Dickinson students out of their comfort zones to discover new talents and to live in a completely different socioeconomic context, and engaged stellar local leaders in life and work at Dickinson: a trifecta of vibrant experiences for any Dickinson student. So tough. Just one? I was given an opportunity to co-host a talent show, and up to that point I had zero experience on any stage. From that moment on I knew that I would always find ways to facilitate groups, be at the mic, and continuously work on presentation and humor skills combined. How do you stay involved with Dickinson? Carlisle continues to be a critical second home to me, and my continued involvement tracks back to one incredible mentor: Dean [Mary Frances Watson] Carson. I would walk on hot coals for her. A few years after graduation, I got involved in supporting her Public Affairs Symposium (PAS) program. I loved it and even got my family involved! The idea that I didn’t take advantage of PAS while at college is such a shame. But what is so great is that I got to embrace it post-graduation. I also returned to Carlisle many times for the high-school graduations of my PEER kids and to visit with the PEER board. How did you get interested in your career, and what about it excites you? My mentors in Carlisle basically commanded me to apply for a management trainee program. It kicked off a diverse career in nonprofit leadership and led to other opportunities, both nationally and internationally. In the end, just as at Dickinson, people seem to invite me into new ideas or broken systems to make a difference. They saw what I only recently understood—I gravitate to the messy, problematic, confusing side of things. It excites me to make something out of nothing or find the gem deep inside a seeming quagmire of mess. What stands out as a memorable event over the course of your career? In 2010 I created an event that invited together some of the most philanthropically effective celebrated athletes and families/individuals who dedicate their lives to social entrepreneurship or philanthropy. What happened at this private weekend, which took place in 2012, is that people combined physical challenges (tennis with Andre Agassi and Steffi Graf, for example), with intellectual challenges (an afternoon of passionate chats on social issues), with culinary delights (six of the country’s top chefs volunteered to host us) and a beautiful desert/spa setting that inspired calm and openness. It happened just once. And as successful as it was in execution, it was a post-event disaster that taught me a ton! I love to relax with friends, good food and good wine. If you could have dinner with a famous person, living or dead, who would it be? The Marx brothers, all of them. "With Eyes on the Future"